This one of a kind Butterfly statement necklace is simply beautiful. I think it has an Art Nouveau look to it. 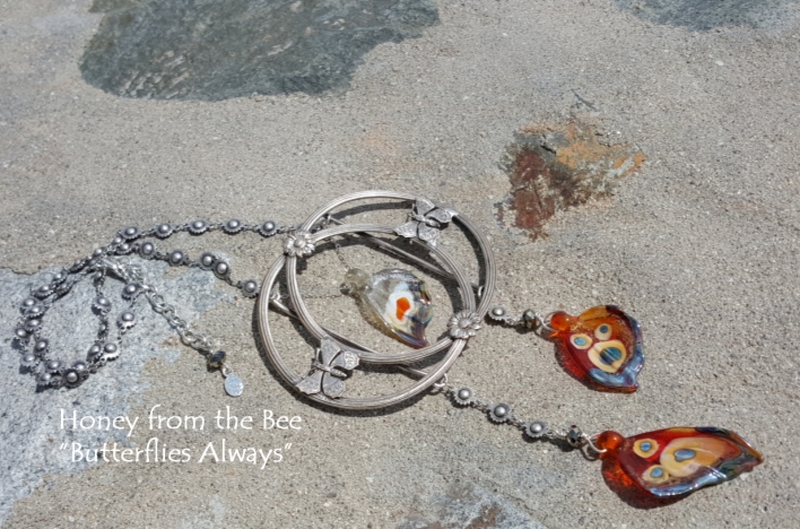 I've created a focal out of a vintage buckle and exquisite lampwork wings by Mandrel Beads. I love the way the buckle appears to be a slide on a necklace of flower blossoms. Truly a statement piece that would look stunning over a black top or dress. For a more casual look - pair it with jeans and a linen or white top. Vintage metal buckle - I was able to give it a nice shine, so my guess is that it's nickel silver. If you are allergic to nickel - don't wear the buckle part next to your skin. Sterling Silver wirework, extender chain and lobster clasp. Adjustable from 18 to almost 21 inches. Focal buckle is 3.25 x 2.75 inches and the longest wing dangle is about 3.5 inches below the buckle. I was inspired to create this piece to bring awareness to the devastating losses of butterflies in our environment. It is believed to be a combination of the use of Round-up, deforestation, and loss of habitat. There are many sources for studies on this that you can check out on the internet. As a nature buff, I just can't imagine a world without butterflies. Can you?